In the year 2010, WION produced the first of its yearly Christmas specials, now produced for 5 years. . The WION staff and friends from our community re-created the Charles Dickens' Classic, "A Christmas Carol" directly from the pages of the 1939 script from "The Campbell Playhouse" hosted by Orson Welles. This first-ever production was completely assembled by audio editing, no actors worked together! 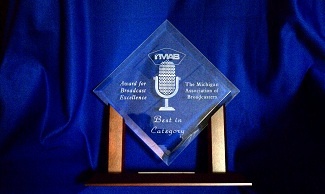 Our efforts and those of our friends and the community earned WION a "Best in Category" award from the Michigan Association of Broadcasters, competing against Grand Rapids and similar markets! 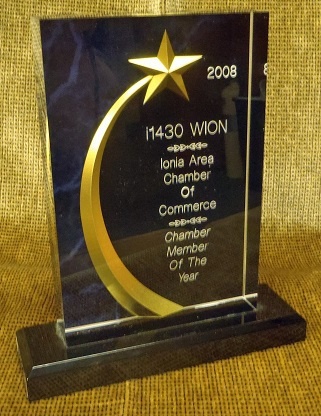 WION Earned the 2008 "Chamber Member of the Year" award from the Ionia Area Chamber of Commerce. The award was given for our involvement in the community, improved service via upgraded equipment, and our continued dedication to Ionia City and County. 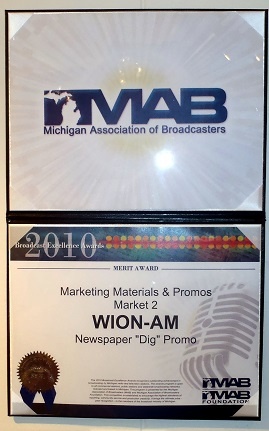 2010 was a GREAT year for WION, with a second MAB award, this one for our creativity in writing and producing GREAT on-air material. Specifically, a promo that compares radio and newspaper. Affectionately called the "Newspaper Dig" promo, it was written by Jim Carlyle, Voiced by Steve Goff, and assembled by "Big Mike" Yuhas. We still bring this back now and then for a bit of WION "nostalgia". Be listening for it! In our First full year, WION installed a new transmitter, making our service more reliable than ever! The award on the right was presented to us by the Ionia County Historical Society in thanks for supporting them, and preserving WION's history while looking to the future, in broadcasting! 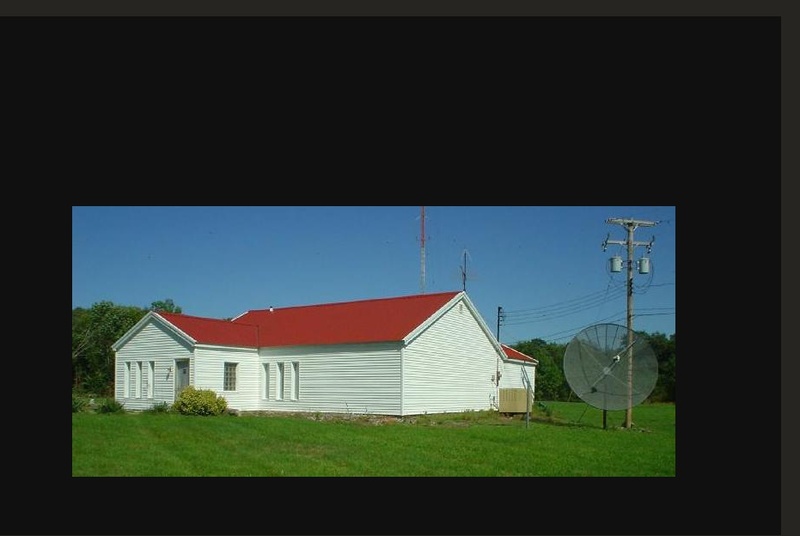 March of 2010 brought our new FM signal to Ionia County! This new signal offered (and continues to offer) our programming around the clock on FM 92-7, without the limitations imposed by the nature of AM radio signals, and by FCC regulations over the reduction of power and coverage after dark. 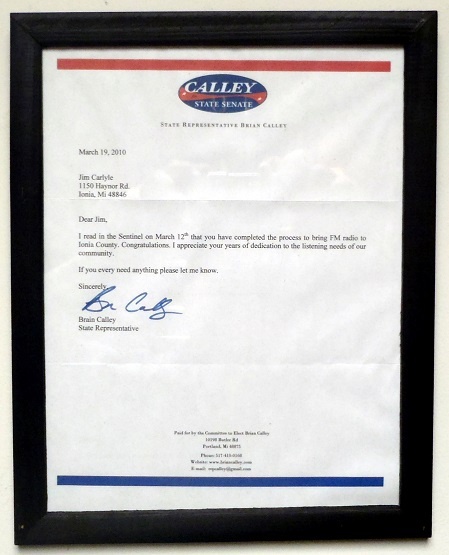 This letter on the right came as a pleasant surprise from (then) State Representative Brian Calley, congratulating WION on this milestone and our continued work to improve radio service to our county. We were very grateful for this letter, now hanging proudly in our studio/musem home on Haynor Road. 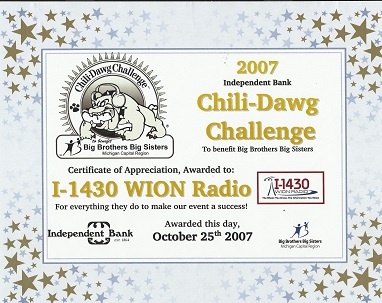 every Chili Dawg Challenge since 2004, in fact, they were our FIRST EVER remote in '04! We raise money through sponsorship messages and give it directly to the event recipient, Big Brothers-Big Sisters serving our area! The certificate above is one of the many thanks from them for years of continued support. 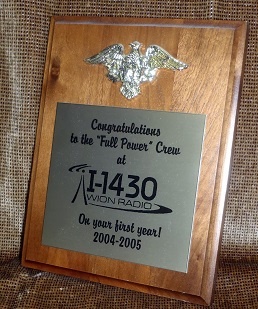 award, also found on the wall at WION's studios. And sometimes the awards go the "other" way. (See left article) In 2011, Bertha Brock Park celebrated 80 years being open to the public. WION was there, as always doing our "Fallfest Broadcast" and, through the generosity of our "Fallfest Invite Sponsors" we were able to raise two thousand dollars for the Park Improvement Fund. In 2012, another 15 hundred dollars was raised, and we hope for great things in 2013, come the third weekend in September! WION is actively helping to promote, grow, and expand our community's outreach by partnering advertisers that care with causes that are locally important! 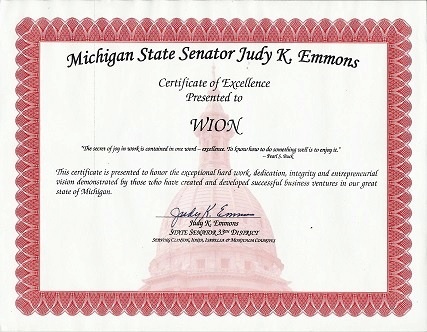 It's certainly a measure of what impact WION has in Ionia!